New #StopFundingHate video now online! We're delighted to share the first of a new series of videos funded by you and thousands of other Stop Funding Hate supporters. 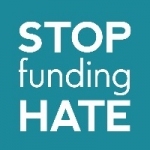 Earlier this year you helped raise over £80,000 to take the Stop Funding Hate campaign to a new level. Since then there have been some big developments - and most importantly, we’ve seen a significant change in coverage within the UK press. When the Daily Mail ran four separate hit pieces attacking #StopFundingHate, we knew this was a sign that our campaign was having an impact. Together we’ve responded with hope and positivity: In just 27 days, we’ve passed our super-stretch target and raised over £75,000 to scale up the campaign in 2018. We’ve just released a new Stop Funding Hate video with details of a YouGov poll revealing what the British public really thinks about the Daily Mail and the Sun. It’s already been shared on Facebook over 1,500 times – can you help by sharing it too? ...But since we launched our Crowdfunder last week over 2,200 people have pledged their support, and together we've sailed past our initial target of £40,000! Our campaign video has now been shared nearly 3,000 times, and had over 177,000 views.